When you're striving for a healthy pregnancy, you tend to focus on things like eating well, exercising and following all of the guidelines set forth by your doctor. However, there may be something you're forgetting that ranks right up there with avoiding high-mercury fish: your stress level. Pregnancy can be nerve-wracking; not only does it entail a lot of physical changes, but preparing to become a parent can take a lot out of you, emotionally and physically. You may figure that it's just par for the course, but did you know that being under extreme stress while pregnant can actually cause problems for your baby? Stress causes our bodies to release hormones in response to the threat that the body perceives -- the higher the stress level, the more hormones our body produces. Since we all handle stress differently, an overwhelming situation for one person may be easily managed by another. Studies are inconclusive as to the exact relationship between stress and pregnancy, but it does seem that the most severe forms of stress, such as a death in the family, can have the biggest negative impact on a pregnancy. That's why it's important to listen carefully to what your body is telling you and to keep your doctor up to date on what's going on with you, mentally as well as physically. Below are the five ways that stress can affect a pregnancy. Preterm Labor & Premature Birth: There are lots of different reasons why babies are born prematurely, but many researchers believe that women who experience high levels of stress while pregnant are at high risk for experiencing a preterm birth. There's a reason why pregnancy is supposed to last 40 weeks -- babies born before this often do not have fully formed organs. The earlier a baby is born, the greater risk the child has of experiencing anything from minor breathing problems to lifelong diseases such as cerebral palsy. Stress normally causes our brains to secrete hormones, such as corticotropin-releasing hormone (CRH). In pregnant women, CRH also helps to regulate the length of a pregnancy, and the amount naturally rises near the end of the third trimester to stimulate contractions. A study revealed that women who delivered prematurely not only had very high levels of CRH early on in pregnancy, but they also reported high levels of stress. Miscarriage: It's every pregnant woman's nightmare. The loss of her baby during pregnancy, known in the medical community as a Spontaneous Abortion. There have been some studies indicating a link between miscarriage and high levels of stress, especially early in the pregnancy or just before conception. In CRH isn't just released in the brains of highly stressed pregnant women; it's also released elsewhere in the body. The CRH targets a type of cell called a mast cell, which secretes chemicals that cause allergic reactions. Apparently, one of these chemicals, Tryptase, prevents the production of membranes to develop the embryo and disrupts the whole architecture of the placenta that feeds the baby. 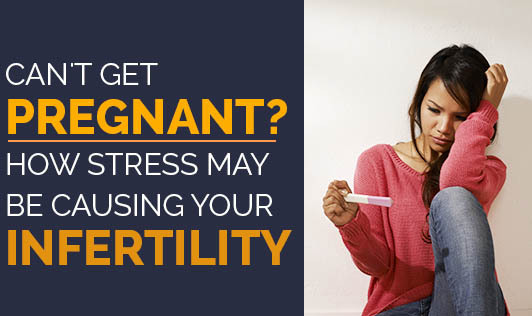 In short, your pregnant body's reaction to stress can lead to a miscarriage if it happens early in pregnancy. Also, high levels of another stress hormone, cortisol, may affect levels of progesterone, which impacts uterine growth and other aspects of pregnancy. So, not only should you try to avoid chronic stress while pregnant, but you should also focus on it early in your pregnancy. Low Birth Weight: Birth weight is an important statistic -- it's right there on the announcements next to name, length, date and time of birth. It's also important from a medical standpoint, although of course there's a wide range of what's "normal" and what's low. Some babies are just small and don't have any problems associated with their size, but others have low birth weights because they experienced intrauterine growth restriction (IGR) -- they didn't get adequate nutrition while in the womb. Babies with low birth weight are at greater risk for health problems like hypoglycemia (low blood sugar) and must be closely monitored to ensure that they are growing at a normal rate. A baby can have IGR even if the mother ate adequately while pregnant. Stress hormones such as epinephrine, norepinephrine, and cortisol can all cause blood vessels to constrict, and this potentially includes the blood flow to the baby via the umbilical cord. In this case, the fetus may not be absorbing enough nutrients from the mother's body. Often, the potential for low birth weight is identified in utero, and your doctor can suggest ways to change the behaviors that may be causing it -- such as cutting down on your stress levels. Increased Risk of Infection: In addition to directly causing problems during pregnancy, the hormones produced by stress can also weaken your immune system. Pregnant women already have lowered immune systems, so stress has even more of an impact on them. This equals an increase in illnesses that your body would normally be able to fight off. In addition, you may also be more vulnerable to uterine infections when you have a compromised immune system. These may involve the placenta and amniotic sac and can be extremely dangerous. The treatment is high doses of antibiotics and inducing labor as soon as it is safe to do so. Uterine infections can interfere with the organ's ability to contract; severe ones may lead to blood clots. The baby can also be infected -- rarely, he or she may develop sepsis (infection in the bloodstream) or conditions like cerebral palsy. Increased Risks of Problems Later On: Chronic stress during a pregnancy can result in issues that may not manifest until later in life. Stress may affect the development of the baby's brain when the high levels of hormones cross into the placenta. These problems may be emotional, behavioral or physical. Stress in pregnant women, especially in the first trimester, may result in irritable, anxious babies. Stress can also cause behavioral problems. And once the baby is born, the child may be more vulnerable to a wide array of stress-related issues. This can mean learning difficulties and slower development. It may even predispose your baby to diseases such as heart disease, obesity, and type II diabetes -- the conditions that stress can create or exacerbate in you, as well.